Founder of Microsoft and Former World's richest man Bill Gates has hired a team of good American doctors for treatment of Pakistani Girl Arfa Karim who became world’s youngest Microsoft Certified Professional at age of 9 in 2004. Arfa Karim is seriously ill and present in CMH Hospital Lahore from almost a month. Bill Gates has talked to parents of Arfa Karim and also offered them treatment of Arfa in United States. Hired doctors of Bill Gates will help Pakistani doctors in treatment of Arfa through Internet and if it will be necessary they will also come to Pakistan for her treatment. 16 Years old Arfa Karim suffered from cardiac arrest due to epileptic seizure last month and from that time she is admitted to hospital in critical condition. 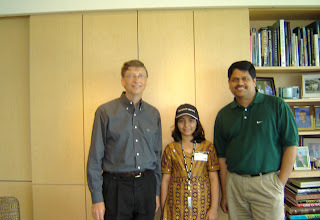 Arfa Karim met Bill Gates in 2004 and also visited Headquarters of Microsoft after becoming world’s youngest MCP. I will request Pakistani nation to do Dua for recovery of Arfa Karim.